Join Alistair Farquharson, CTO of SOA Governance industry leader SOA Software as he discusses how customers are driving efficiency and agility, and are readying themselves for the cloud with service-oriented architecture initiatives. Alistair will describe how some of the world’s largest companies are benefiting from effectively planning, building and operating their SOA environments. 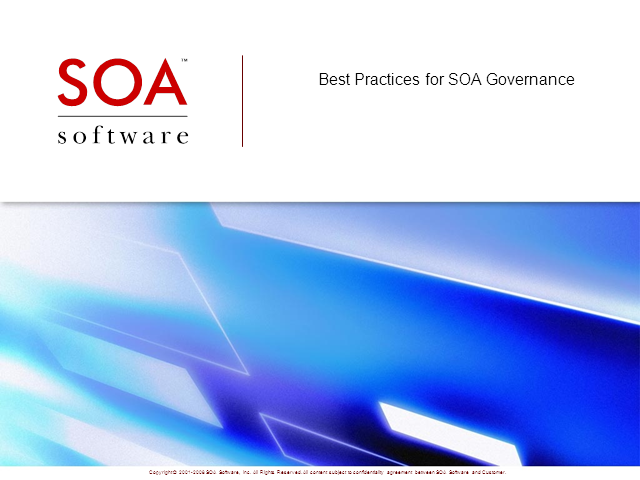 He details how automated SOA governance helps enterprises more effectively leverage SOA to increase business output while slashing their SOA spending. Alistair will show you how F1000s are benefiting from a new agile and full-featured approach for SOA governance and federation that readily fits into their ‘any-to-any’ heterogeneous environments.